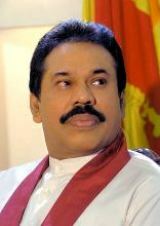 Our first task in our rise to be among the great nations of the world, is to ensure lasting national unity and sustainable, permanent peace in our motherland, stated President Mahinda Rajapaksa after the swearing in for his second term of office today (19 Nov) at the Presidential Secretariat. Our policy is one of non-alignment, he said adding, ‘we do not have enemy states or such groups or blocs. During the last era, we worked with many nations in agreement and friendship for national security. We now step into the development era. We extend our hand of friendship to those who assist us in this endeavour’. We have the inherited wisdom to tolerate all opinion and take mature decisions. We have a tradition of understanding our problems and conflicts and finding solutions for them, he further stated. ‘We are not a miniature of a developed country. We are Sri Lanka. Our motherland is Sri Lanka’. You are well aware that you now stand on our motherland that is much greater than what was handed over to me five years ago. There can be no greater satisfaction to a leader than the humble joy of being able to address one’s people after building a much better country than before, and successfully carrying out the responsibility handed over to me by the citizens of this country. I recall how, five years ago on November 19, 2005, I took over this country in this premises. On that 19th of November when I took over this country it was divided and the Sri Lankan nation was losing this country. Yet, we toiled day and night with patience and commitment, facing all hostile forces, unshaken in the midst of rising storms. Subsequently, on another memorable 19th - the 19th of May - we united this country achieving a victory over terrorism that had its global echoes. Today, on this 19th of November, I take over this country again with the determination, strength and courage to raise my motherland to a position of greatness in the world. Sri Lanka became a united nation, freeing the country in line with the Mahinda Chinthana of 2005. From this day on, we will bring this nation to a position of greatness in this world implementing the policy of Mahinda Chinthana: Vision for the future. Today, I take over this country with more courage, strength and confidence than in 2005. Most of us, throughout our lives, have seen two destructive uprisings in the South and a thirty year long terrorist destruction in the North. I have seen efforts to globally humiliate our motherland through terrorism and separatism, and uprisings. Our task as a nation, on the rise to be among the great nations of the world, is to prevent such bloodshed in another twenty or thirty years. Therefore, our first task is to ensure lasting national unity and sustainable, permanent peace in our motherland. I believe that the eradication of poverty is greater than the defeat of uprisings. It requires true bravery. In the Mahinda Chintana of 2005, we decided to develop the 16,000 villages where more than 80% of our people live. You will feel the change in cities outside Colombo and in the villages where there is a new light of progress in place of the former darkness and ruin around. When five ports are being developed the villages around them will inevitably be transformed into developed economic zones. These rural areas that were ignored from the days of imperial rule are being developed and the nation's doors open for new employment, industry, business opportunity and massive development. We are aware that the developed countries in the world have many other cities of fame apart from their capital cities. When development spreads and the revolution of roadways expands we will have several cities that are not second in anyway to Colombo. This will inevitably lead to a completely different image of Sri Lanka that the world will see tomorrow. The massive power projects now under construction will ensure that by 2012 every home and family in our country will have electricity. Therefore, the land that was freed from terrorism will by 2012 be a land that is freed of darkness. You will soon hear the hum of industry that is powered by this energy. In keeping with the exhortation of our former kings that not a drop of water should flow to the sea without first serving the people, we are today harnessing the water in all our great reservoirs for the task of development. All reservoirs must be used without letting them idle. This will lead to the filling up of our barns, providing drinking water to the people. When we have enough food for our bodies, our minds will be filled with the comfort of freedom. What lies ahead is a period when all of us will have to work hard for our country. Our expectation is to modernize all areas of employment as to make them more productive and provide more revenue. The work of our people should be regarded as an asset and not the result of hiring or slavery. Our labour is an asset of dignity. It is by increasing the quality of work that my country can be made the Wonder of Asia. We have great hope for our younger generation. We will forever remember the way our young men joined the combined forces and brought victory to the nation, which bewildered the world. I lay trust in our beloved sons and daughters while remembering those unparalleled heroes of war who rest in this soil. We must move towards a future generation that is trilingual. It is my hope to raise the level of computer literacy to 75% in the near future and make our future generation true heroes of technology in the modern world. The name of Sri Lankan youth must top the list of those employed in the fields of science and technology. Our generation can achieve this victory by making our country the knowledge hub we intend it to be. What I seek is a country where we can travel from one end to another in a few hours; an era which provides a good income for our people. We must rise by making this country the hub of development in the five-fold areas of naval, aviation, commerce and trade, power and energy, and knowledge. We must make this country one among those with the best quality of life. There is no room for hatred on politics, community, caste or religion when our children are brought up in a life that is replete with all facilities, has shelter and security, and is rich in love and friendship. trees, nature and other species around us. We should move towards development while safeguarding the great humanitarian traditions that exist among our people. Nature as seen in the trees, vegetation and animals in our habitat should also obtain the benefits of the development we achieve. We are not a miniature of a developed country. We are Sri Lanka. Our motherland is Sri Lanka. We have the inherited wisdom to tolerate all opinion and take mature decisions. We have a tradition of understanding our problems and conflicts and finding solutions for them. We understand our problems with perceived wisdom, based on realities. The expectations of the people are not those of the terrorists. We have carried out development work in the North and East as never before in the history of these regions. All development processes carried out in the North and East, are a closure of the highways to terrorism. I strongly believe that this infrastructure to banish poverty is a major part of a political solution. The people of the North were able to use their franchise in freedom at the Presidential and Parliamentary elections. In the forthcoming elections too, we will ensure their right to vote freely and elect their representatives. Our policy is one of non-alignment. We do not have enemy states or such groups or blocs. During the last era, we worked with many nations in agreement and friendship for national security. We now step into the development era. We extend our hand of friendship to those who assist us in this endeavour. There will be no development in the absence of peace, nor peace in the absence of development. Therefore, we will strengthen already existing relations between nations and are ready to establish new relations for national security and development. land free of corruption and inefficiency. We received a huge majority in all regions of this country in the Presidential and Parliamentary elections. The people of this country gave us a huge mandate which cannot be possible through proportional representation. We wish to see everyone in this land become a stakeholder in the future victories that will flow from this great victory, regardless of political differences. There is no higher position you could elevate me to. I too do not see any higher position I could achieve in our motherland. There is only one place I can think of. It is my home at Medamulana where I will retire to. If when I go there, the people of this country who meet me tell me with gratitude, ‘You have done your duty by the country’; that shall be my greatest satisfaction. I value the joy and contentment of my people more than my own. Never in any of my speeches have I referred to my motherland as a small country. I have never called the land of my birth, ‘small Sri Lanka’ or ‘small Island’. This is a land with a great history of many centuries, where the Kalawewa, Ruwanweliseya, Sigiriya, Yoda Ela, Lovamahapaya stand; a land where the Buddha has trod thrice. A land that won our freedom from the world’s most powerful imperialism from struggles that lasted nearly four centuries; and, has defeated the most ruthless and savage terrorist of the world. It is where people who follow four different faiths live in harmony and where today many communities live in brotherhood; and where the world’s largest habour and five other ports are being built, and the strides of development are proceeding to build airports, expressways and massive power stations. With such an abundance of greatness who would dare to say that this is a small island? Therefore, never ever call this a small country. You too must develop your body, mind and word to match the dignity of this land of your birth and take this country to the greatness it deserves. I call on you to follow these words of the Buddha. I wish you all a bright future!